Roomi, a peer-to-peer marketplace for shared housing, has raised $11 million in Series A funding with new investor, Atami Capital, leading the way. 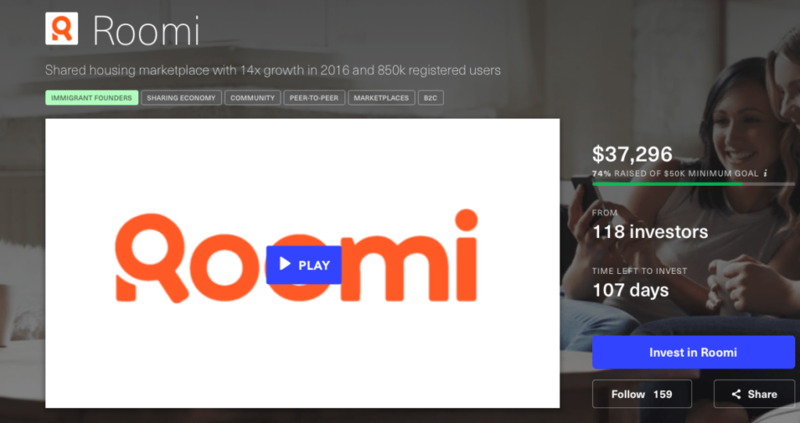 Rosecliff Ventures, Townsquare Media, JXC Ventures, Great Oaks Venture Capital and DCM Ventures also contributed, bringing Roomi’s total funding to $17 million. In addition to privately-raised capital, Roomi is seeking to raise an additional $1 million through a crowdfunding campaign set to end in February 2018. So far, the company has raised $37,296 from 118 investors — $12,074 away from the $50,000 minimum set by Republic, the crowdfunding platform Roomi is using. Investors can give as little as $50 in exchange for “perks” that include a “thank you” note from CEO Ajay Yadav, a shoutout on the Roomi website and a free background check when they list a room. From there, crowdfunders can invest up to $107,000 in exchange for more extravagant perks, the largest of which is a paid trip to Roomi’s headquarters. According to Roomi, the $11 million in Series A funding and any crowdfunded revenue will go toward operating expenses, staffing, marketing, customer acquisition and other projects the team believes may be helpful for revenue and growth. The Roomi process, from start to finish. Roomi launched in 2015 as a safe alternative to finding rentals and roommates, complete with background checks and other verification measures. In the first year, the company raised $2 million in seed funding, hit 100,000 app downloads and expanded into the New York City rental market as competition for Craigslist and Airbnb. Since then, Roomi has made two acquisitions and hit 1 million downloads. Furthermore, the company has been steadily expanding with beta launches in millennial-driven cities across the continent, beginning with Dallas, Austin, Houston and San Antonio, Texas in March 2016. “The future of living is going to be shared living,” said Yadav of the latest fundraising efforts in a statement. “Millennials aren’t buying homes. Gen Z-ers probably won’t be buying homes. Living with roommates isn’t just a trend — flexible living and shared housing is becoming the norm. The Roomi team projects having 45,000 move-ins with $5 million in revenue in 2018. Could your favorite sitcom characters afford their rent in real life?